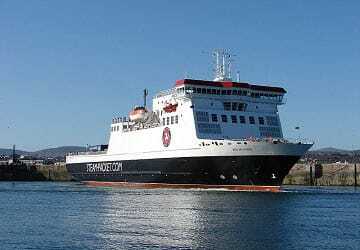 The conventional ferry Ben-my-Chree is without question one of the most reliable ships ever used by the Isle of Man Steam Packet Company in their 180-year history. 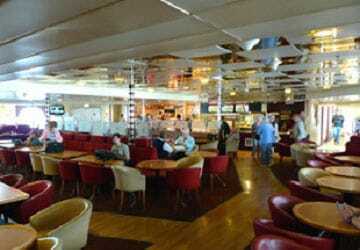 Facilities include a self service food lounge, a cafe/bar and a shop. 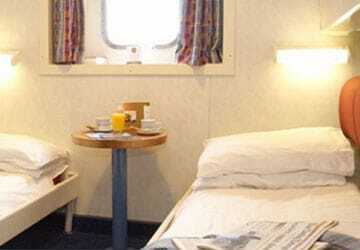 In addition to reserved and premium seating options, the Ben-my-Chree also offers 4 berth en-suite cabins with TV and complimentary tea and coffee making facilities. The Coast to Coast Café offers a delicious range of freshly prepared hot meals including breakfasts and daily meal specials. As a lighter option we provide a selection of sandwiches, salads, snacks, fresh baked pastries, cookies and muffins. Alternatively you can unwind with a freshly brewed cup of Starbucks coffee or head to Legends Cafe Bar which offers passengers a convivial atmosphere to relax and enjoy with stunning views of the sea outside. You'll enjoy the onboard shopping experience with everything from a newspaper or magazine to the latest fragrances there are some great bargains to be found. Wifi is available for a small fee. Coast to Coast Café offers kids meals. Children under the age of 8 are not permitted in the Premium Lounge. The Ben-my-Chree has elevator facilities from the vehicle deck to the passenger lounges and 2 cabins which are suitable for wheelchair access. If you require assistance then please let us know in advance so of booking to ensure this can be organized. Please Note: Whilst we have taken great care in making our Ben My Chree guide as accurate as possible, onboard facilities, services and entertainment may vary depending on the date and time of year that you travel, facilities mentioned may change without notification and ferry companies reserve the right to operate vessels other than those mentioned at time of booking without prior notification. 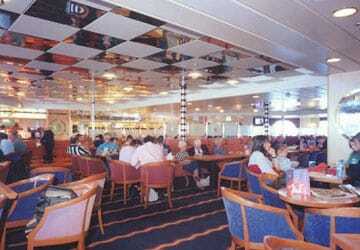 Great sailing, spacious ferry with lots of seating. Food and beverages excellent. Friendly staff. Booking in is easy and can be done in plenty of time. Loading is very swift with no delays to sailing. On board the facilities are ample for the 3 hour journey and I must really complement the food and service. We ordered 4 different meals, 2 were ready straight away, 2 needed to be prepared. These meals were brought to us in the dog lounge when they were ready, we did not have to stand around waiting. All the staff were very helpful and happy to assist, even having time to chat. The whole experience was very pleasurable and relaxing. "In Douglas with Direct Ferries"
Travelled by car to Liverpool for ferry crossing, to find ferry was delayed by 2 hours. All cars were moved constantly to help keep road clear. Eventually got on ferry by which time the sea had started to get rough. The journey was very rough, so rough my wife would not travel back on ferry and had to pay for flight home. Was not given a refund or a upgrade for the executive lounge. Oh we'll that's customer service for you!! Everything went well. I was told off, but nicely, because my suitcase were a bit over the maximum weight. It gives a good image of the isle of Man before even getting there. Regarding the food, it's not gourmet, but it's decent. We left Heysham in sunshine, but strong winds. Experience was new, not travelled on board a ship with vehicle before. Straightford boarding and leaving. Return journey same. Sailed from Heysham to IOM and had a very pleasant crossing both ways, motorbike was securely straped down and safe. Sat in restaurant/cafe compartment which was very clean and comfortable. Not really a criticism, but took 4 hours both trips, which can become a little tedious.